Well, it’s a month since my first post about going vegan, and I’ve settled into this new lifestyle change even more, so I thought I’d share some updates and another quick recipe! One of the most remarkable things I’ve noticed about following a plant-based diet is the variety in my family’s menu. There’s a fairly common misconception that because a vegan diet is restrictive in the sense it does not include any animal products, it must be boring and lack variety. And honestly, when my husband and I followed a macrobiotic diet many years ago, we were guilty of a lack of creativity and inspiration in our cooking. We ate a lot of brown rice, adzuki beans, steamed vegetables, and miso (not to mention lotus root and umeboshi plums!). In the years since, we’ve learned a lot about cooking and both of us have worked professionally in kitchens and bakeries. Our approach to this way of eating is as open and exciting as it was when we were focused on gourmet cooking until just a few months ago. Before embarking on this new dietary path, our weekly dinner menu might consist of grilled salmon, turkey chili, tofu stir-fry, homemade pizza, and pasta with chicken sausage. We would stick to a certain repertoire for a few weeks, then switch it around, maybe opt for baked cod rather than salmon, turkey burgers instead of chili, and so on. In the past week we’ve enjoyed for dinner, multigrain noodles and vegetables with peanut sauce, Cuban black bean soup, falafel pitas, cauliflower and sweet potato curry, and a family-size vegan calzone. All of these dishes and the others we enjoy include good sources of protein, as well as the same fresh vegetables and whole grains we were already including in our diet – and most of them are also low in fat. So far, there is as much variety now, if not more, simply because we are having fun learning new recipes and ways of incorporating new ingredients – or ways of not incorporating things like butter and cheese. Also, the main ingredient in each of these dishes is not meat or dairy, so overall the dishes are much healthier. What became obvious very quickly was just how many cuisines we can choose to cook from, that don’t require animal products at all. For example, we have always enjoyed Indian cuisine, and except for the inclusion of ghee, many of the recipes are ready-made for the vegan lifestyle. An Indian dish is almost always on our weekly menu now, often using the same recipes we had used before, only with slight alterations. There are Mexican dishes that can be made without cheese – or using a vegan cheese substitute, and our family was simply amazed by how “real” the tofu “ricotta” tasted in our calzone. Many of the Mediterranean or Middle Eastern dishes we had been making are also perfectly acceptable on a vegan diet – focusing on pasta or rice, olive oil, beans, fresh vegetables, and herbs and spices. 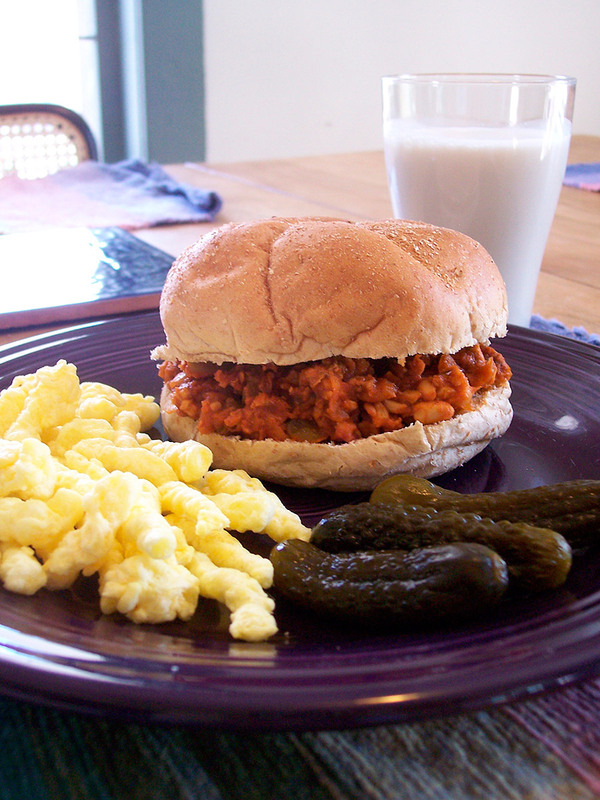 We’ve even done an all-American sloppy Joe using tempeh. I admit, I was at first skeptical about this, but was impressed by the taste and texture of the tempeh filling. 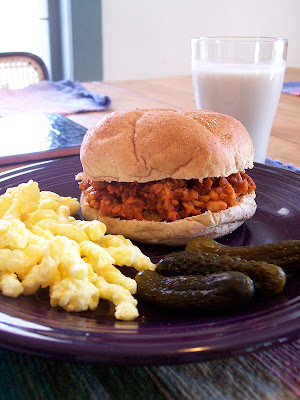 The sloppy Joes were also as much fun to eat as they were when we were kids! For the first few weeks we did do a lot of simple substituting, and it’s great that there are now some fantastic products that make this easy and delicious (and they are not all soy-based). If we had previously made pasta with chicken sausage, for example, we could easily replace the sausage with a flavorful, meatless seitan variety. The cost is a bit higher, and for those who really love meat – i.e. the particular greasiness of meat, perhaps the seitan isn’t an exact duplicate, but for me (never a big sausage lover), the seitan is almost too much like meat. We have made pizzas using a vegan cheese substitute and although they are not entirely like the best New York style they are darn good, especially when loaded up with fresh or roasted veggies (think perhaps, California style). I hope that if you are considering a vegan diet, you will be reassured that it can be a truly bountiful way of eating – and I mean that in the best, most beautiful way – eating vegan truly is an enjoyment of nature’s bounty! Steam tempeh in a saucepan filled with about 2 inches of water - not enough to cover the tempeh. The tempeh is ready when you notice a strong nutty aroma, approximately ten minutes. Drain the tempeh, and mash coarsely in the pan with a spoon or potato ricer. In a large saute pan, heat oil (or water) over medium heat, and saute onion. Key to a good flavor is letting the onion brown. Add pepper, jalapeno, tempeh, and beans, and saute for a few minutes. Stir to prevent sticking. Add chili and chipotle powder, salt, Worcestershire sauce, and tomato sauce. After adding sauce, simmer for a few minutes. Finish by turning up the heat a little and stirring rapidly to thicken sauce. Serve on toasted buns, either as sandwiches or open face. Shown served with http://piratebrands.com/products/tings/original">Original Tings (or as my family calls them - Cheesy Poofs; they are in fact dairy-free and vegan, but with a great cheesy flavor) by Pirate Brands, sweet gherkins, and a glass of almond milk. Very kid-friendly! http://www.fieldroast.com Field Roast Grain Meat Co. – delicious sausage-like seitan. Never having been a huge fan of sausage, I actually find these products almost too meat-like! These are flavorful and high quality. Soy free. http://www.daiyafoods.com Daiya cheeses are our first choice for vegan cheese, for their flavor and meltability. They come in two varieties – cheddar and mozzarella. We are now seeing these in our local major supermarket! Soy free. Almond milk is my personal favorite alternative to dairy milk (in fact, I’ve been drinking it for years and prefer it to cow’s milk). It tastes great in tea. The chocolate is delicious. http://silksoymilk.com Silk and http://almondbreeze.com/Almond Breeze are both good brands and widely available. Soy free. http://www.turtlemountain.com/ So Delicious makes coffee creamers with coconut milk that are quite good – we have not found a substitute for half & half that we really love, but so far these are our favorite. Available in major supermarkets. Soy free. http://www.mimiccreme.com Mimiccreme is another brand that makes coffee creamers, but from nuts. Mimiccreme is heavier and creamier than So Delicious. Soy free. http://www.earthbalancenatural.com/ Earth Balance, available in major supermarkets, is a brand of vegan margarine that is a great choice as a butter replacement. Soy and almond milk can be used as a replacement for cow’s milk in many recipes. Other choices that we have not used include rice and hemp milk. Also, many of these brands make other products that are definitely worth checking out. Coconut oil is also a good substitute for ghee. It has gotten a bad rap but it is the hydrogenated variety that is not healthy. Pure coconut oil used in moderation gives a wonderful flavor and cruchy texture, especially to the vegetables. Coconut is an integral part of south indian cuisine and used in variety of ways, ground, shredded, roasted etc. My favorite preparation is steamed green beans topped with freshly grated coconut. I also stir fry sweet potatoes in coconut oil and it really tastes very good. Thanks, Indira! That is great to know (and I love coconut). The green beans and sweet potatoes sound wonderful. Gail, thank you for providing the updated link and for the coupons! In addition to the coffee creamers, my family has just started enjoying the So Delicious yogurts, and they are delicious - can't wait to try the "ice cream." I've been vegetarian since '95 and vegan since '05. I love how gently you talk about the misconception of not having anything to eat. There is so much variety in the vegan diet. I needed something for dinner tonight. I'm going to make these! YUM! !